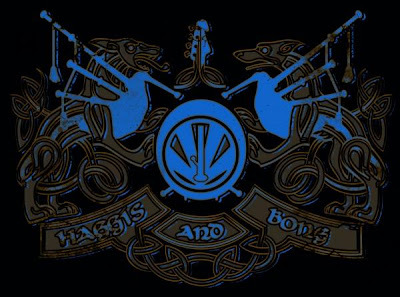 This month's featured band is Haggis and Bong, from Pretoria (South Africa). 4 songs can be dowloaded from the band's Reverbnation's site. "H&B started early in 2007 in an extremely random fashion. Angus and Tom met through a mutual friend and had a once of jam that once off jam turned into a few practices and the rest, as they say is history. After just over a year of writing material and finding their feet the band was ready to release their debut album Fire in the Bowl. With Dominic now on board (joining in early 2008) adding a fuller pipe sound he band was starting to pick up some momentum. Once the album was released (by the band themselves), the goal was to get the CD in as many hands as possible this was easier than expected as CDs were in high demand as soon as they were available. This growth in the fanbase led to the band landing some amazing shows, such as, Splashy Fen, Seasons Wither, OppiKoppi and at The Doors. People could see that this was a band that was serious about what they were doing and could rev any crowd up without fail!! After pushing the debut album for just over a year, the band's focus now turns to next release. The vision for this album is clear to be better, more technical and more enjoyable than the last no small task. Having introduced bassist Xavier to the line-up in late 2009 as well as guest players (for the big shows) Willy and Liam in early 2010, the band now boasts one of the biggest sounds around. The pipes blasting out Triad harmonies, catchy melodies and hypnotic rhythmic lines the drums shaking your soul awake, getting you moving the bass smoothing everything over with a thick layer of funkiness and groove and the trombone bringing styles from punk/ska to jazz. The whole mixture creates one massive "party hard and don't stop" machine!! Angus "Gussy Groovespeare" Nixon - Great Highland Bagpipes, Celtic Tin Whistle, Scottish Smallpipes and The Fool!! !